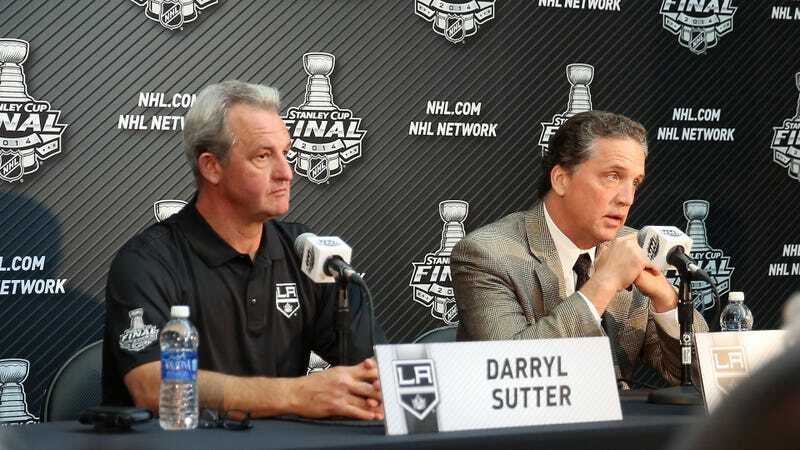 The day after they ended the 2016-17 season with an overtime loss to their crosstown rivals in Anaheim, the Los Angeles Kings announced that they had fired head coach Darryl Sutter and longtime GM Dean Lombardi and promoted a pair of Hall of Famers. Rob Blake will replace Lombardi and Luc Robitaille will become the Kings’ new team president. Sutter led the Kings to two Stanley Cups, but the team has stalled out in the years since they won their last Cup. The Kings missed the playoffs this season for the second time in three years and they have not won a playoff series since the 2014 Stanley Cup Finals. His firing wasn’t altogether surprising, considering the way he (literally) lost the locker room in 2015, though he’ll probably land another job soon if he wants one. Lombardi had been the GM for 11 seasons and he was the principal architect of both Cup-winning squads. Blake and Robitaille each played over ten seasons with the Kings as players, and they have 15 All-Star appearances between the two of them. Blake has been Lombardi’s assistant GM for four years, while Robitaille has been with the team since 2007 as the president of business operations. It’s clear that AEG wants to go in a new direction, one that features former star players.